Fair warning, this may devolve to a love letter. I’ll try to remain objective. 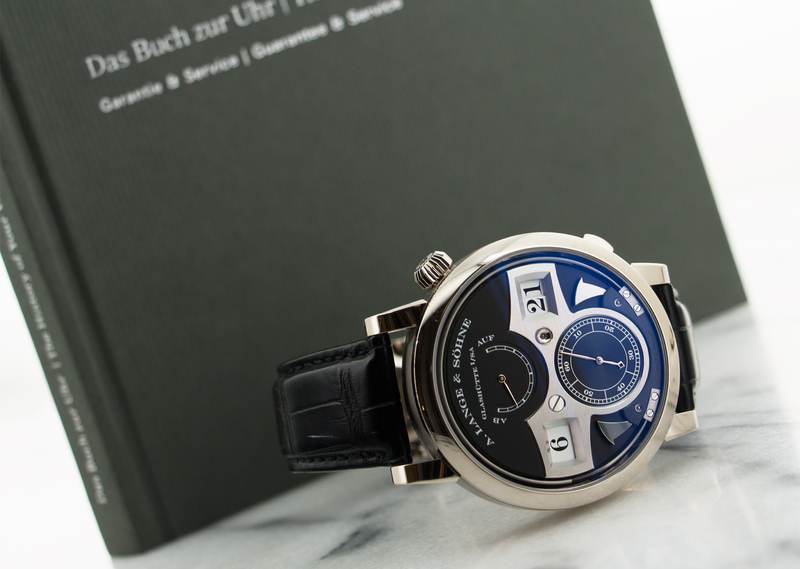 Today we feature a hardly-worn white gold A. Lange & Söhne Zeitwerk from The Keystone. As a ‘standard’ striking-time Zeitwerk (if there is such a thing) 145.029, it’s not a particularly rare reference. However, it is a perfect one. Without a model from Lange yet on this new site, it seems my duty. This particular one makes for a spirited start. When contrasted with the austere Lange 1, 1815, or Datograph, the Zeitwerk appears to have been created on a day Lange left the shop. Perhaps it was one experimental Söhne in 2009 who found their life’s work in Dresden. In fact, it’s a brand-integrated, completely inspired take on modern watchmaking. The design may polarize some, but I know on which side of the chasm I find myself. I’d even go so far as to say a gift from the Saxonian heavens. The Zeitwerk is Lange’s first and only digital display. Please be careful to note that use of the term digital is not synonymous with electricity. The arrangement is rare in haute horology, as they rarely seem to hit the mark (or indeed to sell). However, mechanical digital displays do exit. Consider the FP Journe Vagabondage, De Bethune DB28, or MCT Sequential 1/2; it’s bizarre company to keep. What makes Lange’s take so unique is its inspiration: the Dresden Opera House clock built by Johann Christian Friedrich Gutkaes with help of one Ferdinand Lange (pictured below). It was a sensation some 170 years ago. Somehow, it still manages to stun today in this modern interpretation. To accomplish the arrangement, Lange employed a patented remontoir after the balance (before the column wheel) to store, build, and deploy the necessary energy consistently. In effect, it behaves as a mechanical capacitor. One, two, or three of its discs may revolve, all in concert, with precise jumps. While the dial sports one screw on the left, the rightmost hole is the column which these wheels revolve on. The L043.2 movement that accomplishes this looks as foreign to me as the Zeitwerk itself does to Lange. Then there’s the finishing that sits on top it. Lange are famous for applying the same quality consistently throughout their model range, but I can’t help but feel its something special here. The skeletonized bridge, swan regulator, and anchor-shaped remontoir bridge form a case back totally unique in modern horology. That would be enough, but Lange were not content. In this 145.029, a time striking mechanism sits atop the L043.2. The wheels each have their own snail which tracks and transfers a time code to one of two hammers to strike hours on left and quarters on right. They strike vertical separately set edges of the digital face surround. It is a state-of-the-art statement of art. This example The Keystone holds today is well-chosen: hardly worn, full-set, and well cared for. It is an investment by any standard, but, if you’re as effected as I am, there is nothing else quite like it. Find it here for 85000 USD.